Pentagon officials have often used the word “lean” when talking about the proposed Space Force, an effort to ease lawmakers’ concerns about creating more bureaucracy. But congressional aides being briefed by defense officials privately about the plan remain skeptical about the size of the proposed branch and the number of generals who will lead it. 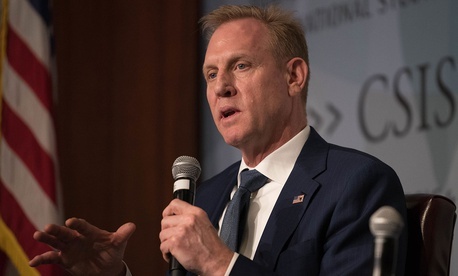 Acting Defense Secretary Patrick Shanahan — who has been guiding Pentagon efforts to streamline space efforts across the military — sought to alleviate those concerns during an appearance at the Center for Strategic and International Studies on Wednesday. Shanahan said the Space Force would be between 15,000 and 20,000 people. That’s already an increase from last month, when defense officials sent a Space Force legislative proposal to lawmakers that talked about an estimated 15,000 civilian and military personnel. And the number of generals in the Space Force keeps coming up on Capitol Hill, according to a source with knowledge of the recent meetings between Pentagon officials and lawmakers’ aides. The legislative proposal foresees the new service led by at least two four-star generals: a chief of staff, who would be a member of the Joint Chiefs, and a vice chief of staff. In addition, the head of U.S. Space Command, a new space warfighting command that the Pentagon is standing up, would also be overseen by a four-star, presumably a Space Force officer. “Three more four-star generals are not going to make us stronger in space,” Rep. Adam Smith, D-Wash., chairman of the House Armed Services Committee, said on March 13 at a conference sponsored by McAleese and Associates and Credit Suisse. As well, some staffers have questioned whether the Space Force chief of staff should be a member of member of the Joint Chiefs. Staffers have also expressed concern about increased funding for the Space Force, the source said. Shanahan said Wednesday that the Space Force “will have a budget the size of SOCOM,” referring to U.S. Special Operations Command, which has an annual budget of about $13.5 billion. The Pentagon’s fiscal 2020 budget request, sent to Congress last week, calls for $72.4 million to stand up a Space Force headquarters staff of about 200 people at the Pentagon. In all, the Space Force is expected to cost about $2 billion in new funding over the next five years. The remaining funds are expected to be transferred into the Space Force budget from Air Force and other service coffers.